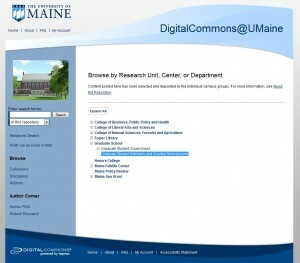 GSG offers UMaine graduate students a Digital Commons service! The Graduate Student Government, as a service to UMaine grad students from all disciplines, is pairing up with Fogler Library’s Digital Commons feature to offer graduate students a way for them to publicize work they are doing in a permanent record, searchable via the internet. 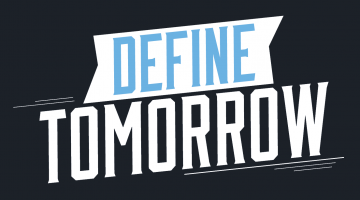 The focus of this is on professional work other than theses/dissertations. For example, a paper that a graduate student has written but has not published elsewhere, yet still would like to have credit and publicity for this work. Through Digital Commons, anyone searching that subject via the internet would find this paper in one of the top results for the subject search. This is something the student can use as a permanent link, to put on CVs and portfolios. This is not just for research papers, though. Other possible contributions are art exhibits, performances, and written work. It is the student’s responsibility to make sure the work is proofread before submitting. This is a permanent contribution and not editable once published. It is also the student’s responsibility to make sure the work follows publishing guidelines according to his/her intent. For instance, if a student plans to publish the work in a journal, the journal may not accept it if it is already on Digital Commons. Or, if the work was previously published, the student needs to make sure the publication allows the work to also be added to UMaine’s Digital Commons repository. Still excited??? Great! This really is a terrific way to get attention and credit for research and other academic work of which you are proud! 2. Make sure the work is polished, proofread and completed, ready for professional display. 3. Send written materials to me in Word format. 4. Images to be posted in galleries should be jpg format. Posters should be saved in pdf format.